At least three people were injured after a shooting in southeast Houston. 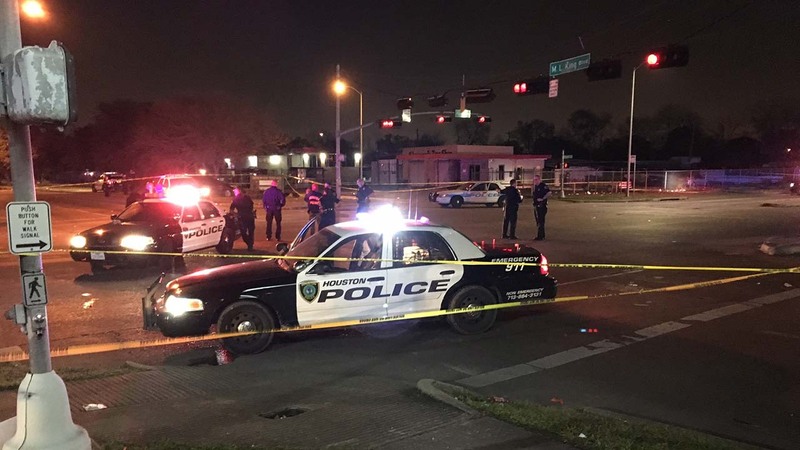 HOUSTON (KTRK) -- Houston police are investigating a shooting that occurred Monday night where at least three people were injured by gunfire. Surveillance video from a pharmacy across the street shows the crowd at MLK Boulevard and Reed Road were enjoying the holiday festivities when bullets began to fly. "Next thing you know, we saw people running from gunshots. I'm in the back of the pharmacy and it was chaos," said Ralphiel Collier, who works at the pharmacy. Police were already on the scene for crowd control at the event when they say a 17-year-old male and two females, ages 17 and 13, were injured by gunfire. HISD confirms the 13-year-old girl attends Attucks Middle School. Many parents learned of her injuries Tuesday. "They really need to stop with these guns. Everyone was out there trying to have fun, then these young guys pull out guns. I feel bad for the little girl," said Gladys Sampson, an Attucks parent. Police are searching for the person or people responsible. Investigators say they have no motive. The people in the neighborhood don't understand how a celebration of MLK turned into a crime scene. "You can't even get out any more. That's not what he stood for," said Sampson. "We're supposed to be celebrating MLK Day, and we're supposed to have a good time. It was awesome earlier in the morning and afternoon, but then...craziness," added Collier. Anybody with information about the shooting is asked to call Crime Stoppers at 713-222-TIPS.